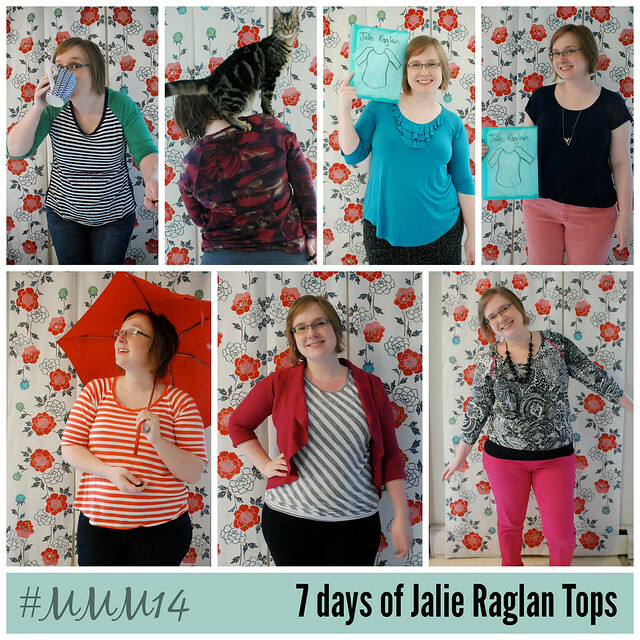 Me-Made May Week 2: Bring on the Jalie Raglan tops! Last week I wore 8 days of Espresso leggings… and this week I wore 7 raglan tops! I bought this Jalie pattern over the winter, and I’ve really enjoyed sewing up different versions. There’s something so fun about sewing raglan sleeves! I also really like wearing the striped-with-green-sleeves version in the top row. It’s a combo of stash fabric, leftovers from another project, and a chopped-up dollar store t-shirt. You can *also* see that at the sides of the shirt there are contrast strips of the same navy polkadot that I used for the neck. This was inspired by a RTW top I saw online, and makes for a fun detail. (I also tried to ruche the sides, but that didn’t really end up showing at all!) This top has good drape and is super comfy to wear. Less successful are the turquoise blue version (too drapey and shows every lump and bump) and the much-altered Cake Carmine that I ended up splicing onto a Jalie Raglan bodice! It’s much better than when I first blogged about it, but I think I’ll be giving this one away! Looking at the outfits makes me wonder where my “ideal” hemline is – I’ve tried a lot of variations with this pattern! And the turquoise on is longer and has a more dramatic baseball hem. What’s your vote: Straight, curved, or very curved hems for t-shirts? Which do you like on me, and which do you like on yourself? PS. Total keeners can read more about each outfit on Flickr! PPS. Tomorrow Elle pants week starts! Woot! Money Matters: How, when and where should I spend my sewing budget? wow! how did you match the stripes so well on the Orange & White version?